A new G Guardian and a new card for “Rex” focused Decks! AUTO (VC): [Soul Blast 1 & Choose 1 of your Rear-guards, Retire it] At the end of a battle in which this Unit attacked a Vanguard, if you have a “Rex” Heart Card, you can pay the cost. If you pay it, choose 1 card from your Bind Zone, Call it to (RC), during that turn, that Unit gains Power+4000. And Now For A Word From The Vanguard R&D Dpeartment!! For Today’s Card, we introduce from the 10th Booster Pack “Raging Clash of the Blade Fangs” (On Sale February 3rd, 2017): 《Tachikaze》’s G Guardian “Absolute Authority Great Wall, Blockade Ganger” and the G Unit “Destruction Tyrant, Full-Blade Rex”. “Absolute Authority Great Wall, Blockade Ganger”, when it Guards, can Retire one of your ally Rear-guards to gain Shield+10000! Which means it can have a total of 25000 Shield. And by choosing up to 2 ally Rear-guards, they gain “During that turn, when this Unit Retires, return it to the hand.”. Its return to the hand when effect works when hit by an enemy Unit’s attack or when they Intercept, and since that activates when the Unit that gained it moves from the Rear-guard Circle to somewhere else, you can return them to the hand. Also, by returning to the hand Units that can activate abilities when they enter the field, such as “Beam Dragon, Apatomaser”, you can aim to activate their abilities again by Calling them. It’s a superb G Guardian that can be used both offensively and defensively. 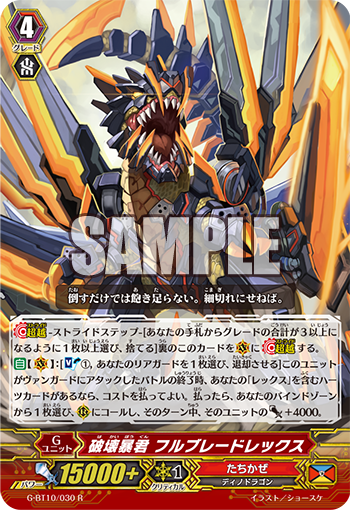 “Destruction Tyrant, Full-Blade Rex” is a G Unit for “Rex” Decks. At the end of a battle in which it attacks an opponent Vanguard, you can Soul Blast 1 and Retire 1 ally Rear-guard to choose 1 card from your Bind Zone, to Call that Unit to a Rear-guard Circle & Have it gain Power+4000. “Destruction Dragon, Squallrex” who can bind himself is an ideal choice. And since you Call during the Battle Phase, you can continuously attack! And since it has no Generation Break, it’s an ideal G Unit you can use its ability even during the first Stride. As well, “Raging Clash of the Blade Fangs” has many cards that enhance 《Tachikaze》, so be sure to enjoy.